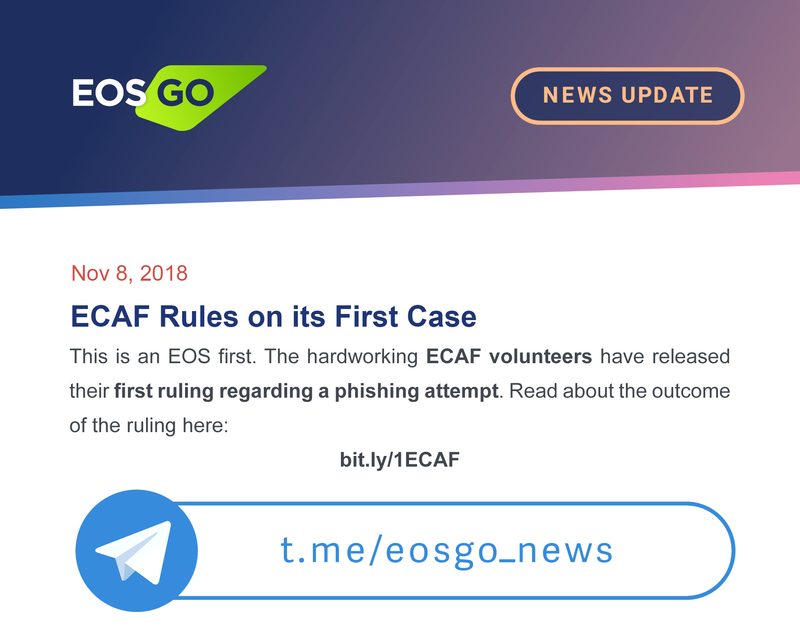 ECAF, the EOS Community Arbitration Forum, has made a ruling in its first ever case. The volunteer-led forum reached a decision regarding a recent phishing attempt and managed to return a stolen account and its contents to the rightful owner. ECAF is made up of a group of participants who are vetted by the EOS community and trained to perform arbitration. The group consists of several arbitrators, case managers, forum advisors, and an administrator. The group took on the case on October 17th, and reached a conclusion on November 8th. Details of the ruling have been published on the site. Some time ago, the claimant in the case registered at an EOS-related website, at which point his private keys were allegedly stolen in a phishing scheme. This would have allowed the attacker to drain his account of funds. Once this was reported to ECAF, the emergency arbitrator froze the account until ownership of the account could be proven. After considering the evidence, ECAF ruled that the EOS account should be returned to the claimant and that the freeze should be removed. This allowed the proper owner to retrieve his funds safely. Additionally, the case will be reopened if another defrauded user comes forward. Because the accused phisher could not be located, the claimant was required to pay ECAF’s hourly fees. The entire process took about 35 hours, which ran a total cost of $400 or 69.8 EOS. Suggested Reading : Learn more about EOS in our beginner’s guide. EOS authorities have been the subject of controversy due to their willingness to freeze accounts, an action that is not possible on many crypto platforms. Critics argue that freezing gives authorities too much control over crypto assets and the blockchain. In fact, frozen accounts were one of the first issues that EOS faced when it was released earlier this year. ECAF was responsible for freezing those accounts as well — a decision that the group made in conjunction with EOS block producers. Those responsible gave little explanation for the decision. This did not go over well with the community, and the events ultimately led to the abolishment of the EOS constitution. By contrast, this phishing case was initiated by a community member, and ECAF has laid out most of its decision-making process transparently. As such, ECAF may be able to convince EOS users that it is on their side. Whether ECAF’s actions are satisfactory to the community will certainly come to light as more of its ongoing cases draw to a close.